Economic Collapse? 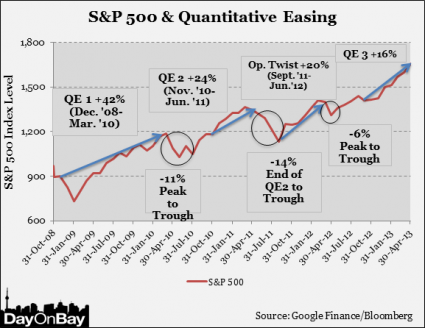 How Will The Stock Market React To The End Of Quantitative Easing? It is widely expected that the Federal Reserve is going to announce the end of quantitative easing this week. Will this represent a major turning point for the stock market? As you will see below, since 2008 stocks have risen dramatically throughout every stage of quantitative easing. But when the various phases of quantitative easing have ended, stocks have always responded by declining substantially. 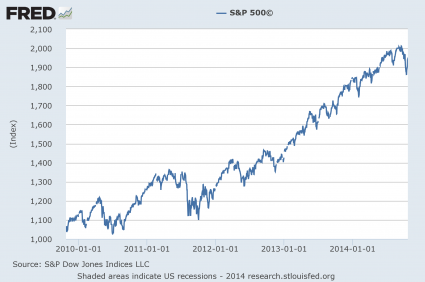 The only thing that caused stocks to eventually start rising again was a new round of quantitative easing. So what will happen this time? That is a very good question. 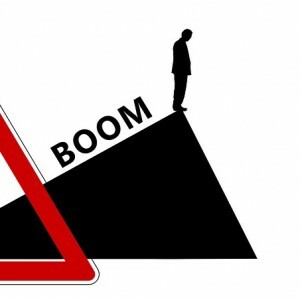 What we do know is that the the performance of the stock market has become completely divorced from economic reality, and in recent weeks there have been signs of market turmoil that we have not seen in years. Could the end of quantitative easing be the thing that finally pushes the financial markets over the edge? After all this time, many Americans still don’t understand what quantitative easing actually is. Since the end of 2008, the Federal Reserve has injected approximately 3.5 trillion dollars into the financial system. Of course the Federal Reserve didn’t actually have 3.5 trillion dollars. The Fed created all of this money out of thin air and used it to buy government bonds and mortgage-backed securities. If that sounds like “cheating” to you, that is because it is cheating. If you or I tried to print money, we would be put in prison. When the Federal Reserve does it, it is called “economic stimulus”. But the overall economy has not been helped much at all. If you doubt this, just look at these charts. Instead, what all of this “easy money” has done is fuel the greatest stock market bubble in history. If someone from another planet looked at that chart, they would be tempted to think that the U.S. economy must be expanding like crazy. But of course that is not happening. This market binge has been solely fueled by reckless money printing by the Federal Reserve. It is not backed up by economic fundamentals in any way, shape or form. And now that quantitative easing is ending, many are wondering if the party is over. Everyone knows that quantitative easing was a massive gift to those that own stocks. So how will the stock market respond now that the monetary heroin is ending? After months of focus on slack in U.S. labor markets, the Federal Reserve faces a new challenge: the possibility that weak inflation may be so firmly entrenched it upends the return to normal monetary policy. The soft global inflation backdrop, from sliding oil prices to stagnant wages in advanced economies, has triggered debate over whether the Fed and its peers merely need to wait for a slow-motion business cycle to improve, or face a shift in the underlying nature of inflation after the global recession. That uncertainty has become the Fed’s chief concern in recent weeks, likely to shape upcoming policy statements and delay even further the moment when interest rates, pinned near zero for nearly six years, will start rising again. If the Federal Reserve and other global central banks were not printing money like mad, the global economy would have almost certainly entered a deflationary depression by now. But all the Federal Reserve and other global central banks have done is put off the inevitable and make our long-term problems even worse. Instead of fixing the fundamental problems that caused the great financial crash of 2008, the central bankers decided to try to paper over our problems instead. They flooded the global financial system with easy money, but today our financial system is shakier than ever. The European Central Bank says 13 of Europe’s 130 biggest banks have flunked an in-depth review of their finances and must increase their capital buffers against losses by 10 billion euros ($12.5 billion). Most people do not realize how vulnerable our financial system truly is. It is essentially a pyramid of debt and credit that could fall apart at any time. Right now, the “too big to fail” banks account for 42 percent of all loans and 67 percent of all banking assets in the United States. Without those banks, we essentially do not have an economy. But instead of being careful, those banks have taken recklessness to unprecedented heights. At this moment, five of the “too big to fail” banks each have more than 40 trillion dollars of exposure to derivatives. Most Americans don’t even understand what derivatives are, but when the next great financial crisis strikes we are going to be hearing a whole lot about them. The big banks have transformed Wall Street into the biggest casino in the history of the planet, and there is no way that this is going to end well. A great collapse is coming.